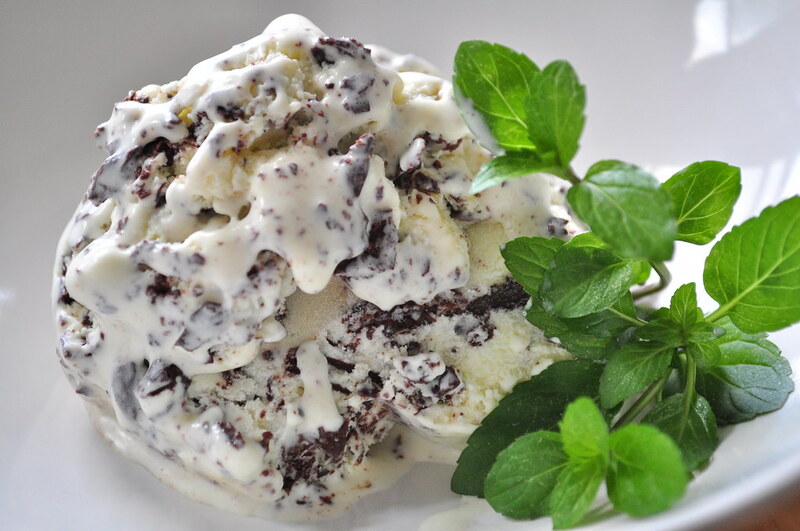 fresh mint & chocolate chip ice cream. – !dpm does! fresh mint & chocolate chip ice cream. 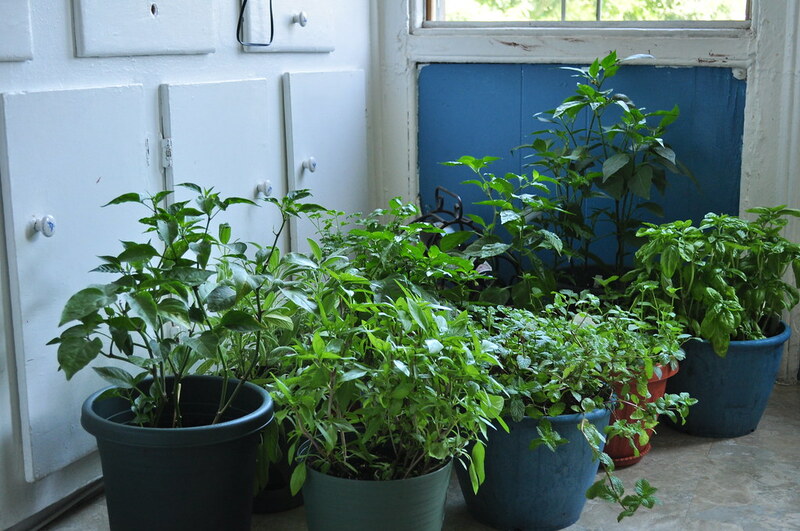 For various and sundry reasons, our fire escape garden has, perhaps permanently, moved indoors. It’s not all that bad, in the end. On one hand, our tiny kitchen is desperately short of floor space but on the other it smells deliciously of mint and basil, and the closeness allows for easy delighting in the budding progress of our jalapeños and habaneros. The smelling-of-mint has us dreaming-in-mint. Add to that a recent purchase of David Lebovitz’s The Perfect Scoop (which we could not recommend more highly), and it was only a matter of time before we started making some fresh mint ice cream. This is not your faux-green, brightly artificial and tasting-too-much-of-extract ice cream. When friends taste it for the first time, their eyes go wide and they look at us searchingly. It just tastes so much like..mint. The admission almost embarrasses them-what else would mint ice cream taste like? But they’re right. It really does just taste so wonderfully of mint. There’s really nothing quite like it. We’re growing peppermint and spearmint this summer, and usually throw in a handful of each, but it works equally well with just one or the other. (Or what about chocolate mint? Or orange mint?) Sometimes, the mint leaves will, in fact, turn the custard just the palest shade of green. The amount of mint is important: it may seem like a lot, but don’t skimp. This is your flavor! David has his own method for making chocolate chips. You can read about it here. We just pour a thin stream of melted chocolate into our ice cream machine (a Cuisinart ICE 21, love) in the last few minutes of churning, and leave chip shape to chance. We tend to go for dark chocolate, usually 70% cocoa – a bit of depth to counter the bright tasting mint. A tip: before you freeze, do leave your custard overnight in the fridge. It may seem excessive, but even the best freezer-bowl machines (of the kind we have and assume more home cooks have as well) work best when the custard is already ice cold. 2. Once the mixture is hot and steaming (don’t boil!) remove from heat, cover, and let stand for an hour. This will infuse your liquid with the mint flavor. 3. Remove the mint with a strainer, and press down with a spatula firmly to extract as much mint flavor and color as possible. Once the flavor is squeezed out, discard the mint. 5. Rewarm the infused milk. In a separate bowl, whisk together the egg yolks, then slowly pour some of the warm mint mixture into the yolks, whisking constantly. This tempers your egg yolks, and helps prevent them from scrambling. Scrape the warmed yolks back into the saucepan. 6. Cook the custard, stirring constantly with a heatproof spatula or spoon, until the mixture thickens and coats the spatula. A good way to test if it’s done is to draw your finger across the spatula – it should leave a clear mark, which indicates the custard is thickened and ready. Don’t let it go too far, or you’ll end up with scrambled custard. If you want to be safe, use an instant read thermometer – it should read around 170F. 9. A minute or two before the ice cream in the machine is done, slowly pour the cooled, melted chocolate into the machine. The chocolate will freeze almost on impact, and the paddle will break up the chocolate into interestingly irregular chocolate “chips”. When finished, spoon into a plastic container, cover and freeze until firm. Previous Previous post: a barbri care package (honey herbed almonds & orange almond biscotti).